Hello, we hope you, family and friends are healthy, had a good holiday, and 2008 is treating you well. Will you be joining us for climbing and trekking in the Himalaya this spring? Welcome to our team of men and women of all ages who love mountain climbing and trekking! Now is the time to send your application. Thanks for telling all friends about our services. If you know anyone who might be interested, please send their postal and email address. By the way, do we have YOUR postal address for our annual Himalayan colour postcard mailing? Please click on one of the links below or just scroll down. On a sadder note, we mourn the passing of Sir Edmund Hillary. Perhaps you will think about marking the moment by sending a contribution to Mount Everest Foundation for Sustainable Development of Nepal and Tibet. UK and Europe - Kathmandu: £680 or €900 on Qatar Airlines includes all tax. Australia - Kathmandu: $1750 Australian dollars on Cathay Airlines includes all tax. USA - Kathmandu: $1200 on Korean Airlines includes all tax. After arranging your flight ticket, it’s time for us to receive your application materials, if you have not sent them already. 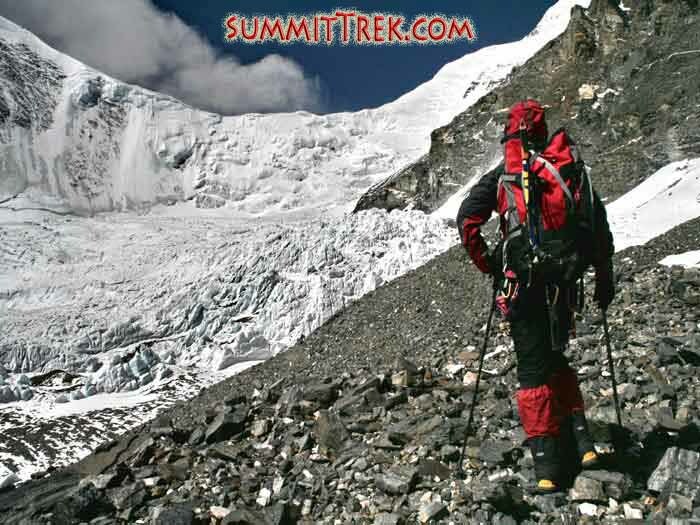 Please download them from the upper right corner of our website www.SummitClimb.com 'Contact Us', 'Applications'. Photo: Heading up to climb Lhakpa-Ri perhaps the easiest way to reach 23,000 feet in the whole world. (Tunc Findik). Everest Nepal Summit Climb April-May 2008. Full-Service: $24,350. Everest Tibet Summit Climb April-May 2008. Full-Service: $19,950. Lhotse Climb, April-May 2008. Full-Service: $9450. Everest Basecamp ABC Trek Tibet April and May 2008. Full-Service: $2450. Everest Basecamp Trek Nepal April-May-October 2008. Full-Service: $1650. Service Trek June and November 2008. Full-Service: $950. NEW CHO-OYU TREK COMING FOR AUTUMN 2008. Island Peak Easiest Climb, April-May-October 2008. Full-Service: $790, £350, €550. Lhakpa-Ri Easy Climb, March-April 2008. Full-Service: $5450, £2750, €3650. North-Col Easy Climb, April-May 2008. Full-Service: $5450, £2750, €3650. Glacier School Starter Course July 2008, with Dan Mazur. No Cost. Cho-Oyu Climb, April and September 2008. Full-Service: $8950, £4350, €6050. Shishapangma Climb, October 2008, combine with Cho-Oyu: Full-Service: $7150, £3450, €4650. 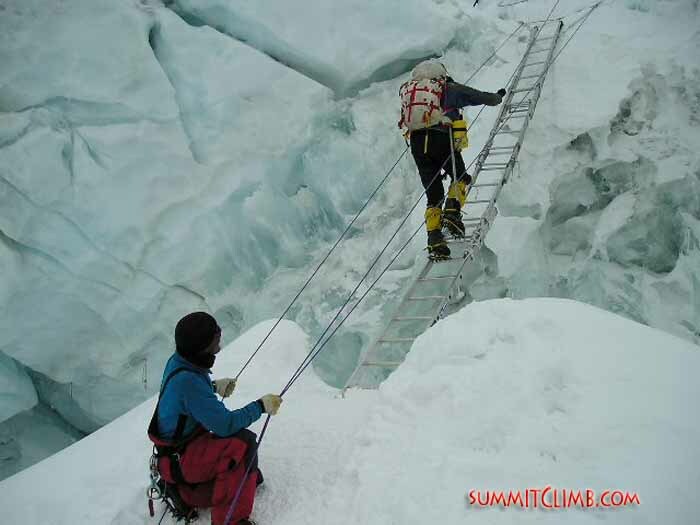 Ama-Dablam Rock-Ice Climb, October 2008. Full-Service: $4950, £2450, €3350. Mustagata Climb, July 2008. Full-Service: $3950, £1950, €2650. Aconcagua Easy Climb, February 2008, Jan-Feb 2009. Full-Service: $2950, £1450, €1950. African Climb-Trek-Safari, Kenya, Kili, August 2008 or January 2009. Full-Service: $4150, £2050, €2850. Our Africa and Aconcagua trips are in the field. with our excellent leaders Doug, Dave, and Ryan. Watch the current news. If you are requesting a good Sherpa for Everest, Lhotse, or Cho Oyu. we need you to reserve now as we have 29 of the best and when they are all reserved, that’s it. Same goes with your Oxygen order for Everest, Lhotse, or Cho Oyu. We need your O-2 order now. Our leaders are among the best. Please visit the leader slideshow. We are looking for leaders, so please join our leader training programme. Going to Tibet this spring? If you would like to enter from Lhasa we can arrange a flight over Everest for you, and then a drive in from exotic Lhasa. New trips: Lhakpa-Ri in March, Cho-Oyu + Shishapangma double summit in September and October (some crazies want to ski/board it!) . Our new Cho Oyu trek will take place in September. Join us. Do well on Lhakpa-Ri in April and progress directly to Everest or Cho-Oyu in May. New Winter Mountain School any weekend this winter. Announcing our new school in the White Mountains of New Hampshire in January and February. Leader Bill Yeo is an Everest summitter and excellent teacher. Watch for our lecture tour in Autumn 2008 and Winter 2009. We want to tell our stories to YOUR group and raise money for charity non-profits at the same time. Join our Service Trek and help the local people help themselves in June and November. Please keep the questions coming. For easy and rapid help, take a look at the specific questions and answers section on our website. We have been working a lot on these "q & a"s, so tell us if they have been of help, or how we could make them better. Do get in touch, as I look forward to discussing our favorite topic: Mountains! Thank you very much. I await your reply, wish you all of the best, and look forward to meeting and making your trip a success. 1. Pps. Do we have your current postal address? We send out colourful Himalayan cards twice each year and would like to post you one so would you please email your address? Thank you. 2. Ppps. Would you like to have a conversation about this? Please call me anytime at: 360 570 0715 or at: (+44) (0)7810375400 (evenings are best). If I am not here, be sure to leave a message with your number and I will call you right back! 3. Pppps. Thanks for telling all of your friends about what we are trying to do. -Please tell your friend and ask them to mention you on question 16 or 17 of the registration forms and we will send you a 'finder's fee' cheque. 4. Ppppps. Not ready to go this Spring? We have a lot coming up this Summer and Autumn. Also there is always 2009.